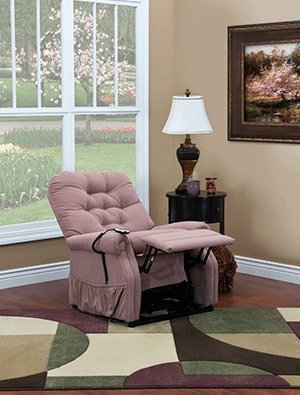 The Model 1555 is Med-Lift's Petite Lift Chair Recliner. This chair will fit someone between 5' 0" and 5' 3" tall, who weighs up to 275 lbs. 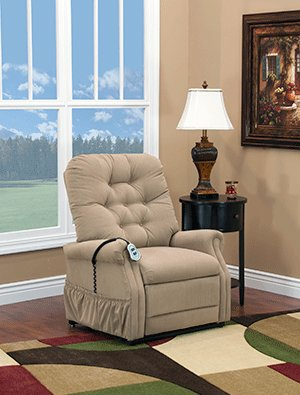 With a seam back, this economy Petite Lift chair is great for any household. Floor to Top of Seat 17"
Seat to Top of Back 23"
Back of seat to end of footrest reclined 34"
The model 1553 (standard petite) is Med-Lift's petite version of the button back chair. 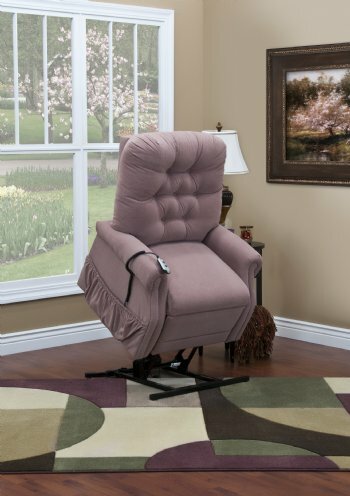 Model 1553 comes standard as 3 way recline with Low volt DC motor with quick disconnect hand control and full chaise pad. This series also comes standard with arm and head covers and a magazine pocket on the right side. Has our SDS® (Self diagonistic system to help find electrical problems) This chair will fit someone between 5' 0" and 5' 3" tall, who weighs up to 275 lbs. With a seam back, this economy Petite Lift chair is great for any household.